So, dear Charge readers, please contact Jim at jsvinski@gmail.com if you have any of these figures to trade or to sell. Cannonball reader Mark Anderson supplied these photographs which first appeared in the Birmingham News supplement on June 24, 1956. Identifiable figure manufacturers include Bussler, Wm. Britains, and Tru-Craft. The 1950s marked the beginning of the golden era of toy soldiers. So many manufacturers came and went in the 50s and 60s, with so many wonderful memories for a generation of boys. I had a huge collection of 54mm figures, which included Marx, Timpo, MPC Ring-hand, and so many others. My kids, and now my grandsons, played with them as well, so we have received three generations of fun and entertainment from the toy soldiers. 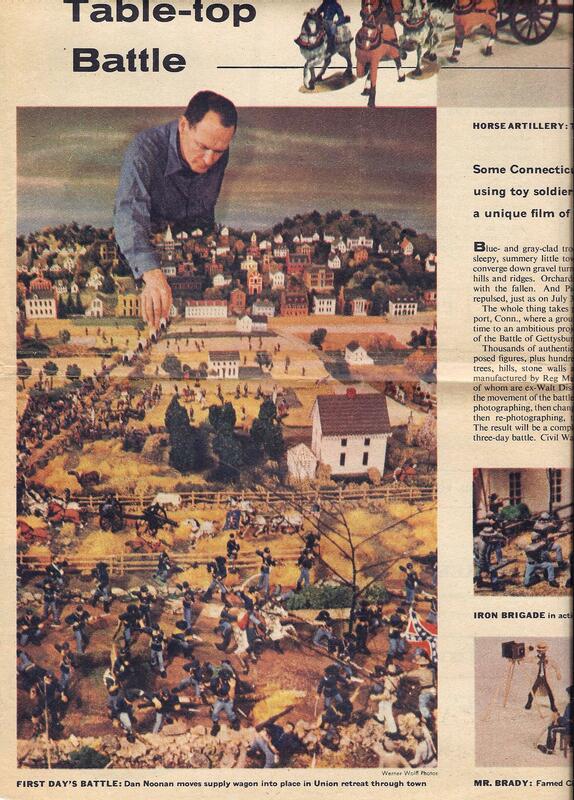 One wonders what ever happened to the Connecticut diorama shown above and below? Scan of another page of the old newspaper article from 1956. Ike was in the White House, and interest in action-oriented themes was high. It was the era of Davy Crockett, science fiction, toy soldiers, cowboys and Indians, and the like. 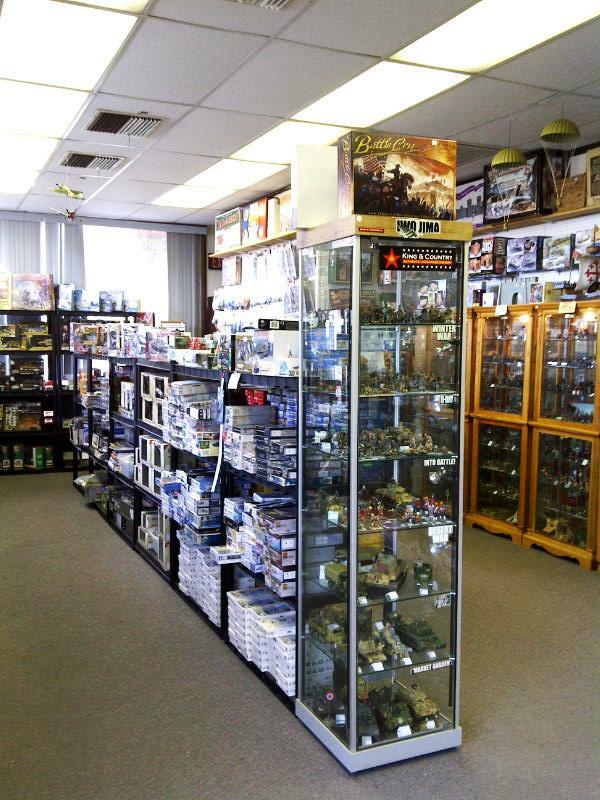 Gettysburg Miniature Soldiers’ expanded store! 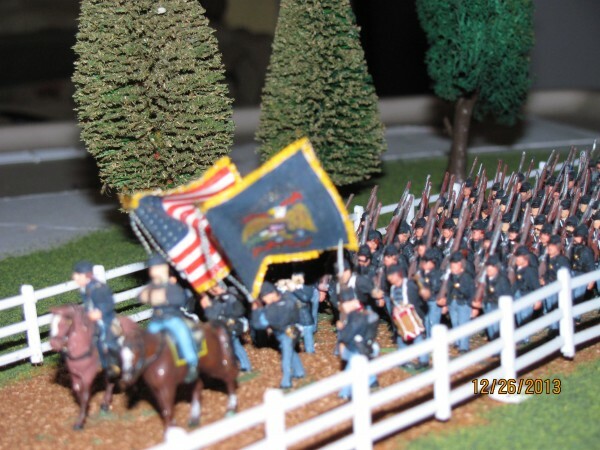 Some time ago I reviewed John Zabawa’s Gettysburg Miniature Soldiers, one of my favorite stores in Gettysburg. Click here to see the photos of John’s previous store, which occupied less than half the space he now has since he expanded into a vacated adjacent business. Here are some photos I took today in Gettysburg as I dropped off some of my Civil War books to John (he now carries my autographed books Flames Beyond Gettysburg and the Louisiana Tigers in the Gettysburg Campaign, as well as the ACW naval rules River Wars which I edited and published). I had a wonderful childhood, growing up in a small lakeside village nestled in the scenic wooded hills of southeastern Ohio. It was an area steeped in history; an area where famed Civil War generals Phil Sheridan and William T. Sherman grew up. My own family was rich in Civil War heritage, with direct ancestors on both sides of the family serving in the Union Army, including three of my great-great-grandfathers. My Dad, whose 97th birthday would have been yesterday, and Mom gave me a giant set of Civil War toy soldiers for Christmas back in 1962. It was the 54mm Marx Giant Blue & Gray playset which I believe they bought at the local Montgomery Wards store, which my Mom frequented in those long ago days. As a kid I played with them extensively and lost parts of the set in my outdoor “wargaming” activities. The rest survived the years, and are now enjoyed by my two grandsons. Here are a few shots of the remnants of that old playset (I also still have the tin mansion). As a kid, I used to love going to the S. S. Kresge’s discount store in the city near where I grew up. The store was a treasure trove of all kinds of exciting things for a young lad, including an extensive candy counter on top of which often were boxes of baseball cards, World War II cards, Davy Crockett, etc. The food counter was a special treat; sometimes my family would eat at Kresge’s during our once-a-week trips into town. By far my favorite memory is the toy section. And its two chief attractions were the little Transogram statues of major league baseball players (which I still have) and the huge bins of ten-cent Marx Warriors of the World. I recently found some of my old toy soldiers tucked into a large storage box of duplicate baseball cards. I was fortunate to be a guest author / signer at the recent Gettysburg Militaria, Relics, and Book Show at the All-Star Complex near Gettysburg, Pennsylvania. My host was Jim McLean of Butternut and Blue, a Baltimore-based dealer of toy soldiers and Civil War books. Among his specialties are 55mm figures from The Collectors Showcase, which are among the finest (and more expensive) collector figures on the market today. This photo shows a hodge-podge of different 1960s toy soldiers. The redoubt is from my Marx Civil War playset (the 1963 Centenniel Blue & Gray playset). The figures manning the guns I bought at S.S. Kresge in Zanesville, OH about 1966-68, and I am told they are Crescent figures from England. 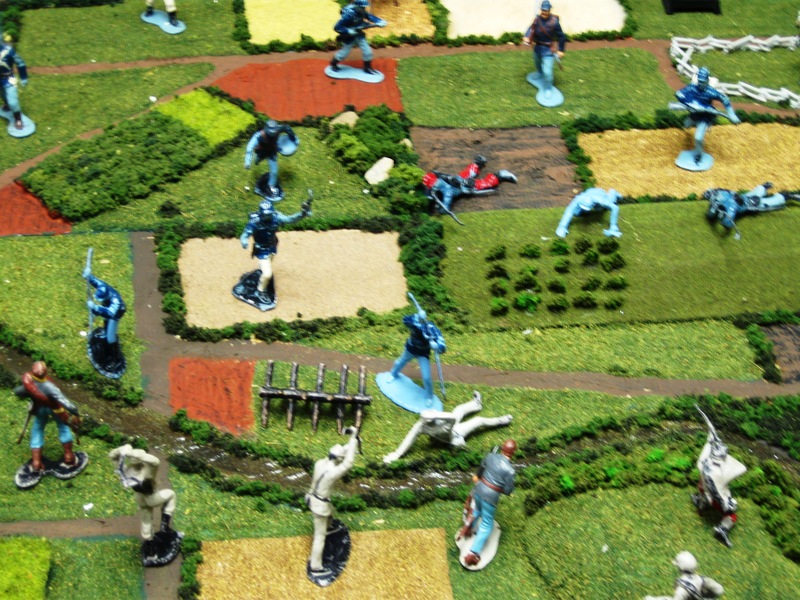 The soldier blue figures to the right center are Marx 54mm cavalry figures from the Fort Apache playset. 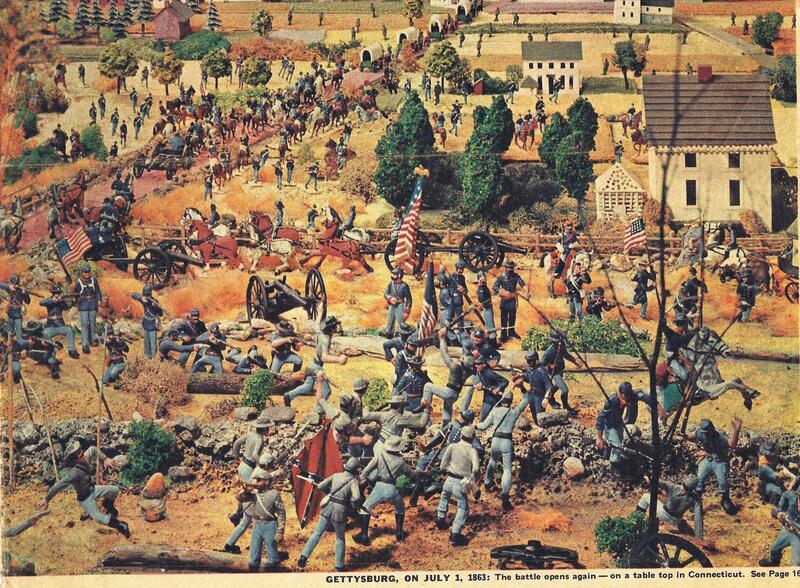 The figures at the bottom right are Britains, some of which came from Gettysburg’s Fort Defiance gift shop in 1968. The brownish figures are Marx 54mm figures from their Boonesborough playset, including Daniel Boone. Some of the gray figures at the lower left are more recent figures and were from my kids’ childhood in the 1990s. Another view of the Marx redoubt and the unknown figures… the ones to the upper left of course are vintage Marx Centennial figures. In the spring of 1862, Confederate Maj. Gen. Zachary Thomas led his veteran division on a mission to raid Federal supply depots and to disrupt enemy communications and logistics. He also hoped to draw the Federals’ attention away from the main lines, and, in doing so, open the way for the Confederates to retake most of Kentucky. One of his objectives was the sprawling Union supply depot near Scottsburg, where he hoped the local civilians would rise up and join the Confederate cause. Defending the depot was the relatively untested Union garrison under Brig. Gen. Michael Lynn. It was a hodgepodge force, made up of various companies recruited throughout eastern Kentucky, including the Marx Guard, the MPC Rifles, the Britains Scouts, The Tim-Mee Warriors, and the Ideal Company. Lynn had a field gun, and a pair of old mortars at his disposal, but ammunition was scarce, and the nearest trained crews were at Fort Rebecca forty miles away in Ashland. Colonel Leroy Marks led the Confederate troops on the left, where they slammed into the Federal Marx Guard. A wild melee soon ensued, and the Rebels entered the outskirts of the depot. The old Fort Defiance tourist trap at Gettysburg, Pennsylvania, is shown in this 1972 photograph provided by Mike Waricher. In the summer of 1968, my parents took my sister and me to Gettysburg for our first overnight trip to Pennsylvania (little did I know then I would be living in the Keystone State as an adult and writing books on Gettysburg!). I remember that trip with fondness! My sister Peggy and I enjoyed riding through the tunnels, and we stayed in a TraveLodge in Chambersburg. The following morning, we drove eastward on Route 30 to Gettysburg, and I will never forget the mystical experience of seeing the first monuments peering through the morning fog! I think that was the moment that I knew I was hooked. How’s that for a grouping of beautiful figures??? These little gems are a new product from Conte, and had just arrived at their new quarters at Gettysburg Miniature Soldiers on Saturday. Owner John Zabawa has tens of thousands of other figures for sales at his Steinwehr Avenue store, which your Charge! editor featured in a previous post. And, yes, this is the first time ancients have ever appeared in any Johnny Reb Gaming Society medium, either in hard copy or on this blog. Perhaps these guys might have been useful to Major General George Pickett for the final rush on the angle during Pickett’s Charge???? When I was a kid in southern Ohio, my Mom always used to tell me not to play with pointed sticks. Now I know why.